Game capture uses the game source feature to directly capture your PC games and add them as a source in XSplit Broadcaster. Game source works with PC games that run on OpenGL and DirectX 9-12. Go to Add source > Game capture then click the name of a game you currently have running. Selecting Auto Detect will automatically switch between games that are in focus. Some games that run using DirectDraw, anti-cheat engines and mods are known to have issues with Game Capture. 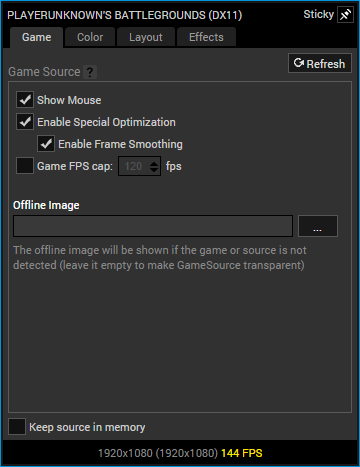 You can access additional settings for your Game Capture source by right-clicking on it or selecting it then clicking Settings on the Source List. Enabling this will make the mouse cursor visible in the capture. Enabling special optimization lessens stuttering issues and improves fps for games (especially DirectX 9ex and 11 games). Note that some games require this to be disabled to be properly captured. Removes frames to maintain a smooth framerate of capture. Limits the FPS of any game that the game capture source hooks into. See below for more information. Click here for information about Color, Layout and Effect settings for sources. You can use the Game FPS cap option to limit any game that game capture source hooks into. This is useful for games with no FPS limit options or if you are trying to lessen the load on your computer's resources. The Game FPS cap setting will not be preserved when changing scenes unless the Keep source in memory setting is also enabled.